As we ease into canning season, everyone is thinking about pulling out their canning equipment. Yeah! That’s caused an upswing in questions on tools and equipment lately. 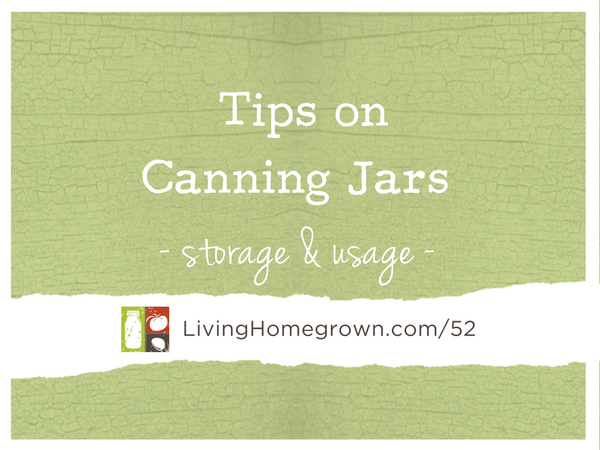 So in this episode, I tackle four of the questions I received on just canning jars and their storage. I have to tell you that I love some of the interesting questions/topics people write to say they would like to see covered on the podcast, blog or even the TV show. We catalog every single question and use it to guide my content. But…unfortunately, I can NOT answer each question individually. Between all my channels, I get well over 100 questions per week. (And during peak canning season, I can get over 100 per DAY) It is impossible for me to answer those questions and run my business at the same time. However, I do try to answer those questions on the podcast or in blog posts – especially when I get several questions asking the same thing. In other words, your questions and requests guide my content. And very much appreciate knowing what you would like to see here. From Colette: You mentioned that we should store our jars with the rings OFF. So what do you do when you give jars as gifts? Do you remove the lid or give it with the lid on? It is true that I talk a lot about how we should store our preserves with the canning rings off. But when you give a jar as a gift, it is important to include a ring so that the recipient has a way to hold the lid on when they store the opened jar in the refrigerator. Also when you give the gift, you can use it as a teaching moment to educate the recipient about proper storage. If they are not going to open the jar right away, they should store it in the pantry with the ring off. Rickey Asks: How do you store jars in the refrigerator? Which lids do you use? My favorite go to lid on canned goods are the used lid and ring that come with the jars. They are easy and convenient. In fact, I like to use canning jars and old “used” lids to store leftovers and other things in the refrigerator – not just canned goods. Remember, a canning jar lid can only be used once for canning. This is because the rubber gasket in the lid become indented and might not make a good seal the second time. But that same lid CAN be used to store dried goods on the pantry shelf or office supplies or even leftover dinner because in those instances, you are not trying to create a vacuum seal. To prevent myself from accidentally reusing a “used” lid for canning, I use a sharpie to mark the tops of used lids with a big X. That way, I know they can only be used for general storage – NOT for canning. Stacy: Do I really have to check the rim of my canning jars every single time I can? Yes, Stacy – it is important to verify that there are no nicks or chips on the rims of your canning jars. Any nicks can cause a seal failure (either during processing or later while the jar sits on the shelf). It only takes a minute to visually examine each jar or run your finger (carefully) around the top of each jar. If a jar does have a nick or chip, don’t throw it away. Just retire it from canning and use it for storing dry goods or other uses. You can take an emery board (nail file) or some sandpaper and smooth out any rough chips so that you will not cut yourself. The nick will cause an air gap and seal failure. But it has not bearing on storing dry goods such as rice or dried beans or even office supplies. Crystal asks: How do you store your jars so they don’t chip? I wrote all about it in this post on streamlining your canning. It may not be practical for you to organize in the same way. But as long as you prevent your jars from crashing into each other, they should be fine. Stacking empty jars on a shelf or even in a single layer in a cardboard box works well. What would cause canned beets to go bad? They sealed and tasted greate for almost a year..then still feeling tightly sealed and popping when opened, they have that “tingly” taste that lets you know they aren’t good any longer. All canned food is supposed to be consumed within 1 year. Remember, you are not stopping the deterioration of the food…only slowing it down. So the food will continue to lose quality, nutrition, texture, etc. There are many, many factors that can cause one particular jar to go bad – too numerous to go into detail here. And it is impossible for me to determine what went wrong when I don’t know the recipe, the technique or storage of the jar. I wish I could give you a simple, easy answer. But there are too many unknowns for me. So sorry. Great episode! I just wanted to say your mention of reCap mason jar lids made me smile. They are designed and made here in my hometown (Erie, PA) and I’ve supported a couple of their Kickstarter campaigns as they expanded their offerings. A great little company! So thanks for mentioning them! They are a great company Amanda! I just love them to pieces. 🙂 I’m so glad you have supported them – I didn’t know them during the kickstarter. I learned about them much later.